Home » Letter #5 – Want to Be Found? If you would like the opportunity for customers to find you through the Stampin’ Up! system, please be sure you are familiar with the Stampin’ Up! Directory and Stampin’ Up! Demonstrator Locator. Directory (Available to all demonstrators): If a customer wants to find a specific demonstrator and knows their name or location, they can enter this information in the Demonstrator Directory, search, and find their demonstrator. All active demonstrators who opt in (through your Referral Policy Agreement*) are part of the Demonstrator Directory. A demonstrator does NOT need to have a DBWS (Demonstrator Business Web Site) for this option. Demonstrator Locator – Only available to demonstrators who have a DBWS: If a customer doesn’t have a demonstrator and wants to find one in their own area, they can enter their address in the Demonstrator Locator. It then displays contact information of ten demonstrators in their area. Opt in (through the Referral Policy Agreement*). IMPORTANT: You must “opt in” in order to receive this referral benefit. The example below shows you how to update your profile. Please remember that the Demonstrator Locator requires you have an active DBWS. 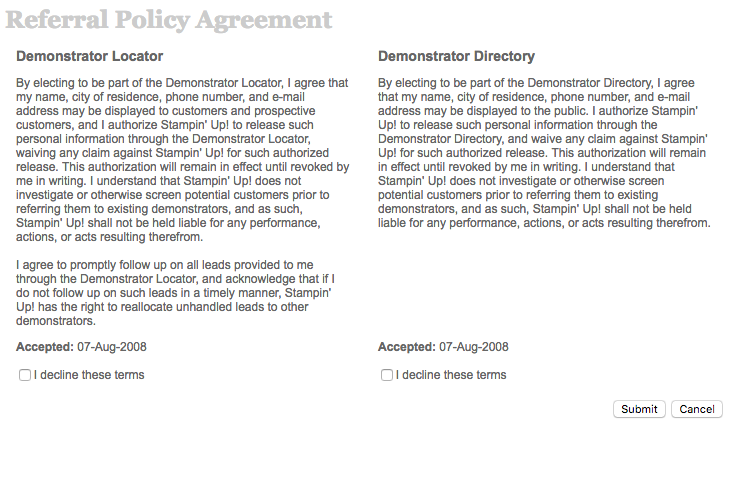 * To find the referral policy agreement, log into the demonstrator website. Click on your name and in the drop-down menu select referral policy agreement. TIP: Sometimes, even after opting “in” to the referral agreement, a demonstrator’s info will not pop up in the searches. In most cases, if a demonstrator lets demonstrator support know (1-800-STAMPUP) know, they can go in to a demonstrator’s profile in their system and perform what is called a “Demonstrator Locator Update.” This assists in setting valid latitude and longitude coordinates for a demonstrator so that they will show up properly in the locator on the web. They will re-verify the coordinates and in most cases when they do this and “save,” the demonstrator is located without any further issues. P. S. Are you missing out on our creative fun? Be sure to join the Pals private stamping groups on Facebook for ideas, friendly stamping discussion and prize patrol. Not a Facebook member or user? Reply to this email and I can help you get set up.